Last August 2010 I wrote about Michael Mobbs, an Environment Architect well known for his sustainable house at Chippendale. 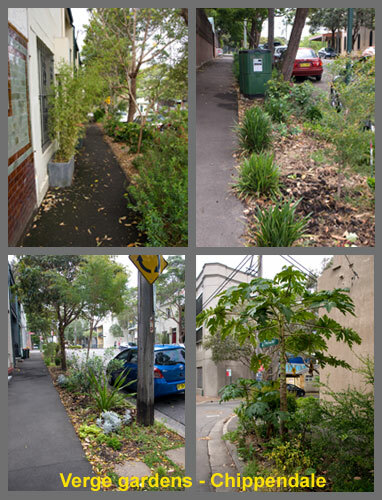 He encouraged his neighbours to transform the verges outside their houses into sustainable gardens in at least 4 Chippendale streets. This is quite an achievement & has been very successful. The bustling verges are immediately noticeable when you drive off Cleveland Street into the streets that are part of this project. The verges make these inner city streets look peaceful & it’s far nicer than looking at concrete or strips of lawn. City of Sydney Council has come on board by openly supporting the project, supplying funds & signage, removing concrete & allowing some of Peace Park to be used. They may have even supplied the compost bins located on street corners & in the small park. 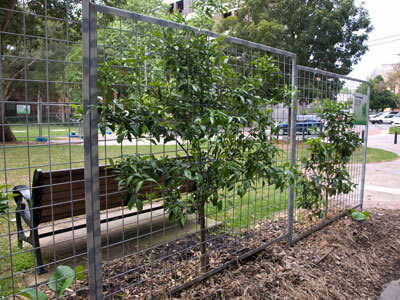 Fruit trees have been espaliered along one side of Peace Park creating an eatable fence. 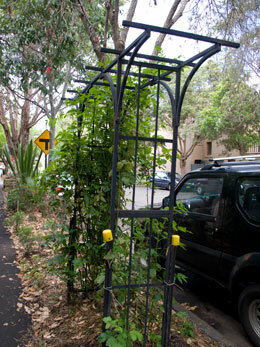 It looks great & allows 4 fruit trees to grow without taking valuable space from the park. There are vegetables, herbs, fruit trees, bay trees, wild raspberry, daisies, Grevilleas, succulents, native grasses & many other plants. There may even be potatoes growing under a couple of car tyres. Some of the plants are labeled with home-made signs making the walk just a little more interesting for people like me who can’t identify every plant they see. I spoke to a couple of people who noticed I was taking photos & they were very proud of what has been achieved. Most of the small front gardens were also well looked after & many cuttings have migrated to the verge. The sheer variety of plants makes it look interesting. The street trees that were once encased in concrete are now sitting in the middle of well-watered composted gardens & would be wondering at their luck. According to the signs, you can, “Pick any fruit, berry or leaf that you want to eat. These plants provided by local residents for anyone. 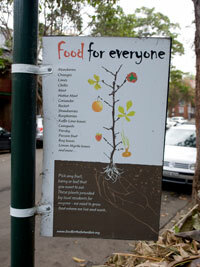 We need to grow food where we live & work.” How lovely to see such generosity. Anyone who has grown vegetables & fruit will know that unless you bottle everything, there is generally more than you can eat when a crop ripens so sharing makes sense. Using the verges to grow vegetables, fruit & other plants has many benefits. Removing concrete allows stormwater to go into the ground & this serves to keep your foundations more stable & stop movement & cracking walls. It also stops pollution entering stormwater drains. The immediate environment gets greener & this has proven to make people feel happier. Producing food cuts down grocery bills & gives people a huge sense of satisfaction. It also teaches children that vegetables don’t come out of clear plastic bags & that they need to take care of the earth & the environment. Most kids like gardening if they don’t have to work too hard or for too long. Add the concept of sharing to everyone like this community has done would have an accumulative benefit that spreads outwards into the greater society. Projects like this one bring people out of their homes & allow them to get to know each other in a non-threatening way. A close community is a safer community. As the soil gets richer & the plants start to grow & produce people would feel as though they are a part of something that improves the environment & helps each other. Verge gardening encourages innovative thinking in that there isn’t much land to use so people have to think of ways to maximize the space. It also beautifies & cools the area & creates community pride. A few months ago, the then Mayor Sam Iskandar wrote in the Inner West Courier that he hoped many people would start verge gardens in Marrickville LGA. He said Council would help them by removing concrete in suitable places if they applied. We have a new Mayor now, but I’m confident that Fiona Byrne who is a member of Marrickville Greens also encourages verge gardens. The September 2010 Eco Edition of Marrickville Matters said Council was starting up Groundwork, a grassroots sustainability project where people will be taught various gardening techniques & “designing, installing & maintaining gardens – especially non-traditional ones like on verges & roofs.” This would certainly be something good to be involved with. If you look there are many, many verges around Marrickville LGA where verge gardens would be suitable. From experience, you only need to start doing it to garner the interest of your neighbours & it is nice to have that bit of extra land to play with. If we all did it, Marrickville Council could save up to $2 million a year in verge mowing costs. That money could be used for other things such as street tree planting, which is another way we can benefit. Great post, really like the espaliered fruit trees – long been a fan of this management technique for smaller trees in tight spaces. What a lovely looking street scape…they have every right to be proud of what they have achieved and continue to achieve.